Back in September I was down in Nashville, TN, which is one of the only cities to have a physical store for Vintage King Audio. While I was there I had the opportunity to check out a few of my mixes, as well as other tunes on the monitors they had to demo there. I really was impressed with the Barefoots and Focals, but the quality I felt was not worth the $7k to $20k. It’s a case of diminishing returns, once you get to a certain quality range there is more you can do to improve it, but only by smaller and smaller factors as the price rises quickly. I wondered to myself, would it be possible to build a pair of speakers myself that would surpass any mid-range studio monitors, and come close to the quality level of high end monitors. I already had built a few guitar cabinets and a bass cabinet, and had a book on loudspeaker system design…so between that and the wonderful resources available on the web I decided to take on my largest and most complex to date. My thoughts were, provided it’s a good design, if I spend what I would on a pair of mid-range monitors on drivers alone, then the end product should rival much more expensive systems. After all, the largest cost in a speaker system is not the drivers themselves, but the engineering. There is a lot that goes into the design of a high fidelity system (and more math than you would imagine). I knew I wanted to do a 3-way speaker system in order to have clearer midrange. 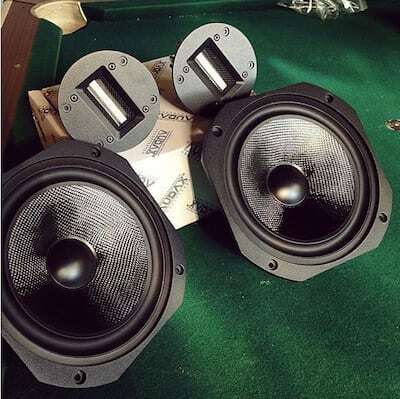 A common problem with 2-way speakers (especially at higher volume levels) is the mid-range gets distorted by the large movements of woofer reproducing the low frequencies. If you separate the low frequencies and mid-range into separate drivers, that helps improve clarity of both parts of the frequency spectrum. There are a lot of different parts to a speaker system; Amps, Crossover, Woofer, Midrange Driver, Tweeter, Enclosure, and more. Fortunately I already had a 6 channel amplifier sitting in the back room of our studio, so I decided to use that…saving me significant money. Since it had six 100 watt channels I decided to use that and go tri-amped, which gives me more headroom. Driver selection is essential. You can’t just pick 3 random speakers and hope for the best. I knew roughly where I wanted to put my crossover points, so the first step was to select drivers that would not only work well within their given frequency range but also with one another. I knew I wanted my system to be able to produce lows as deep as I could. I spent a lot of time looking over potential woofers, but the Audax HM210C0 8″ Carbon Fiber Woofer really impressed me with it’s specs. It’s resonant frequency is 31 hertz. Carbon fiber is a great speaker material choice because it has a high stiffness to weight ratio, which also yields very good transient response. The next driver I chose was the tweeter. We used to have a pair of Adam Audio A5X, I really liked the clarity and detail of the highs on their monitors, so I decided to use the same type of tweeter. Ribbon tweeters also have a wider dispersion pattern over a wider frequency range than other styles, which gives you a larger sweet spot. I found the Fountek NeoCd3.0, which had good reviews as well as specs right in line with what I needed. Finally the mid-range, I decided on Scanspeak Discovery 12W/4524G, it had good reviews, fit the range between those two drivers, and was of a small enough size & weight cone to respond quickly. I heard a pair of passive radiator subs while in Nashville and really liked their sound…..not to mention passive radiator enclosures are a little easier to design and tune. Passive Radiators work on the same principle as the ported system. A tuned amount of air that is able to move in and out of the enclosure with the woofer. Both are great options but both have their strengths and weaknesses. Ports are harder to design and can create a whistling air sound. Alternatively passive radiators allow lower tunings in smaller boxes as well eliminates any port whistling, however they cost more and have slower transient response. That is part of the reason I chose the carbon fiber woofer. The enclose needs to have a separate chamber for the woofer and mid-range so the driver’s movements don’t affect each other. Volumes of enclosure for ported and passive radiator systems are basically the same, so i chose to go with Audax’s recommendation of 2 cubic feet for an F3 of 40 hertz. This gave my woofer plenty of internal volume to tune its response really low. The mid-range enclosure has a volume of 0.6 cubic ft. and doesn’t have a flat back wall, instead it turns 22.5° every couple inches. Cabinet resonances are bad for quality sound reproduction, for that reason I used double walled birch plywood. One and a half inches thick on all exterior walls with internal bracing. They are 80 pounds each, but I don’t have to worry about the walls yielding annoying resonances. The inside of the bass chamber and mid-range chamber is stuffed with rock-wool. We have found that to be the most effective acoustic treatment on the market. It works over a larger range than just about any other dampening material, as well as is fairly even across the full spectrum. This helps eliminate standing waves and reduce reflections inside and off the rear wall back through the cone of the speaker. Additionally….in terms of behavior of the driver, acoustic stuffing makes the driver act as if it’s in a larger enclosure by slowing down the speed of sound traveling through it. Tweeters in general, but especially ribbon tweeters ribbon tweeters need a protection circuit. This is simply a capacitor inline with the tweeter that doesn’t allow low frequencies through. This prevents the DC pop from turning on an amplifier from damaging the ribbon. Ribbon tweeters measure as a direct short at low frequencies, so without the capacitor inline, you would damage both your tweeter and amp. The capacitor I went with is ClearlyCap’s ESA range, which is specifically designed not to introduce any resonances in the usable frequency range. As I mentioned before, I am using an amplifier with six 100 watt channels, and tri amping the loudspeakers. Output B of our monitor controller patches into a DBX 234s stereo 3 way crossover. The crossover points are 180 hertz. and 1.8 kilohertz. Each frequency band is then sent to individual channels on the amplifier with the amplifiers output level calibrated for each driver’s specs. Once it was fully built and everything was in place it took some calibration to get it all sounding right. It took a lot of listening to material I was extremely familiar with, tweaking where the crossover points should be, and tweaking the levels of each of the drivers. All in all, I am really happy with how they turned out. The lows are deep, big, tight and firm thanks to the quick responding carbon fiber woofer and large chamber with rock-wool fill. Mids have great clarity, guitars seem to jump alive. The high end is detailed, articulate, and fairly smooth. The imaging is very wide and has a good sized sweet spot. Unfortunately they are a bit large for near-fields, and are probably better suited as mid field monitors. our typical listening position for our Yamahas is too close to the new DIY studio monitors, so when using them it’s best scoot back 12 to 18 inches. They also seem to have a very subtle build up around 400-600 hertz, though that is a nice compliment to the Yamaha studio monitors which are subtly lacking at the same point. You can listen to various material mixed on this in our live from bad racket video series, our audio work page. Contact Henri Rapp for more information about commissioning your own build or if you have questions about the design.